boats.com spoke with Alan Blanco of the popular social media page—Center Consoles Only—as part of a new monthly series where we highlight a different boat each month. There’s an ongoing arms race in the center console market. Outboard engine manufacturers and boat builders are pushing the limits on how big they can go. Tapped into the community of owners and enthusiasts on social media is Center Consoles Only, which recently surpassed 77,000 followers on Instagram. Their posts profile everything from owners showing off their 15-foot flats boats to sneak peeks of HCB Yachts’ (formerly Hydra-Sports) new 65 Estrella. 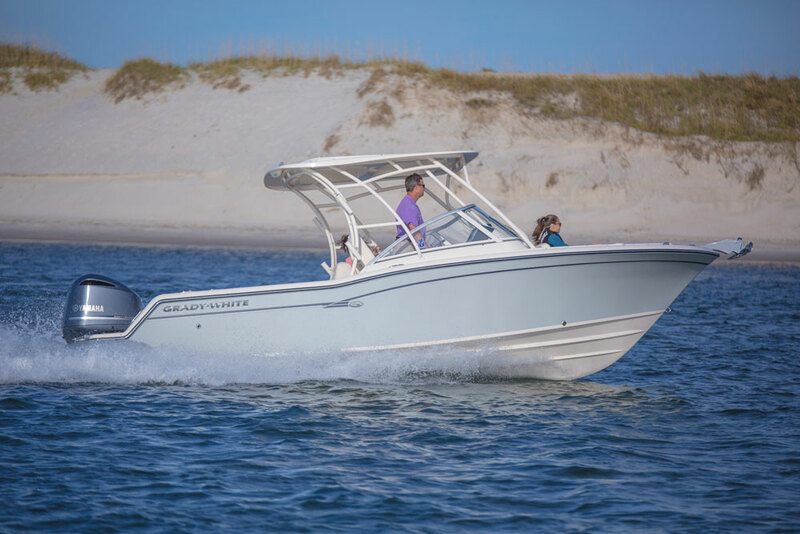 As part of a new series, we’re sitting down with the man behind the account to profile a different center console boat each month, starting with the Grady-White Canyon 456. At 45 feet long with a 14-foot beam and tipping the scales at 12 tons dry, she is the largest Grady-White ever built. 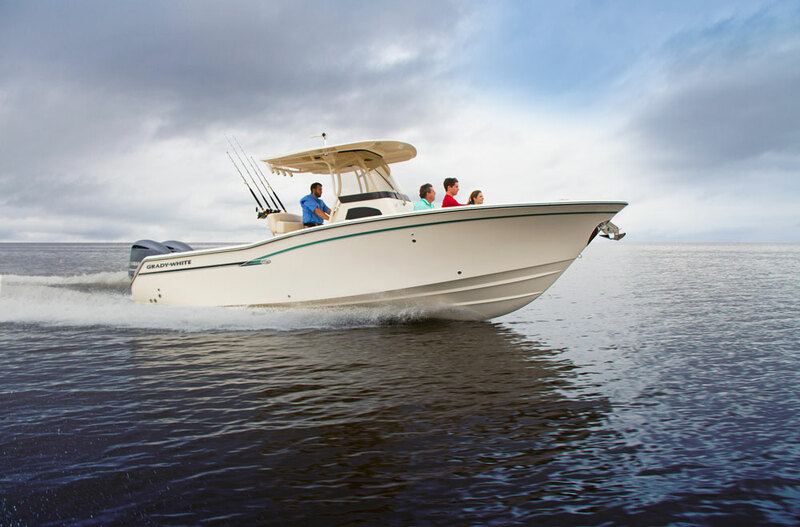 We had a chance to review it at the Miami International Boat Show earlier this year. 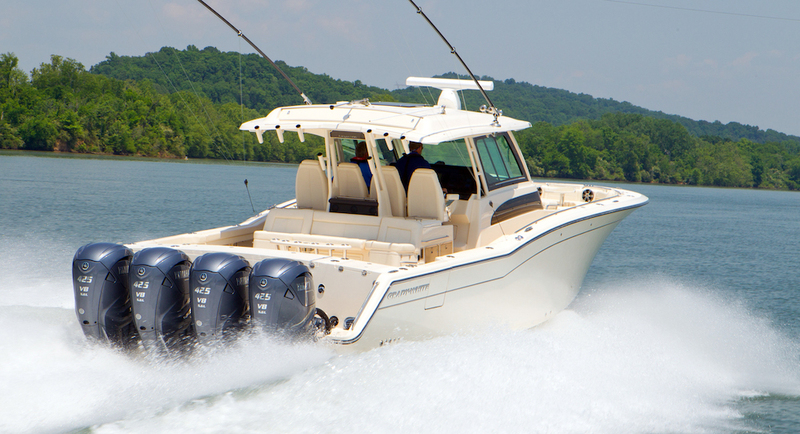 Quad Yamaha XTO Offshore 425 outboards pushed the 35,000-pound Grady-White Canyon 456 to 58 mph and made it handle like a dream. boats.com (bc): I know you were also at the boat show in February, did you happen to see the Canyon 456 in person? Center Consoles Only (CCO): I was there, but I unfortunately missed the Grady-White section. 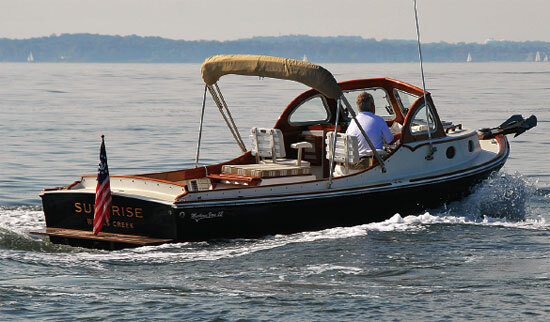 From what you’ve shown me so far and reading the specs, it looks like the most impressive boat they’ve built yet. bc: What did you think of the 14-foot beam? It was by far the widest center console of that size that we have ever been on. CCO: That beam is one of the first things that really stood out to me. 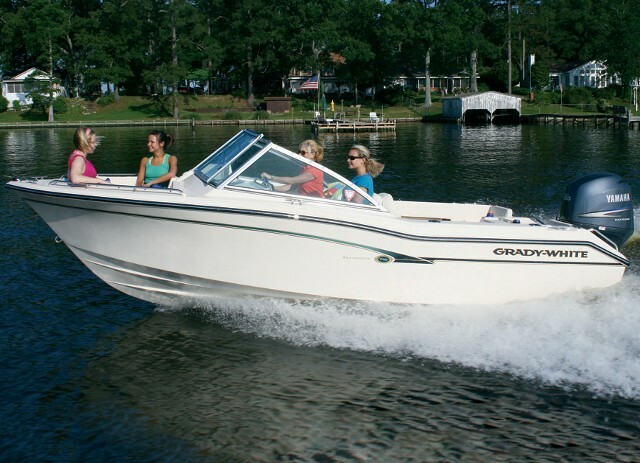 For example, there are 53-foot center consoles on the market that have a 13-foot beam and the Grady-White is eight feet shorter than that. They also have a quad-row of seats at the helm station where we mostly see three. That also has to be possible because of the beam. bc: So much space in fact that they added air conditioning vents in the transom-facing mezzanine seating. There’s also a screen mounted in the transom. CCO: I wouldn’t be surprised if we started seeing other manufacturers start putting screens there too in the future. There’s so much new technology being added to these boats it seemed inevitable to have more screens added somewhere other than the helm or in the cabin. bc: We tried to answer the question in our review: Is this a yacht you can fish from, or a fishing boat with the creature comforts of a yacht? After all, you can store 32 fishing rods on-board. CCO: It really speaks to the higher end of their customer base. 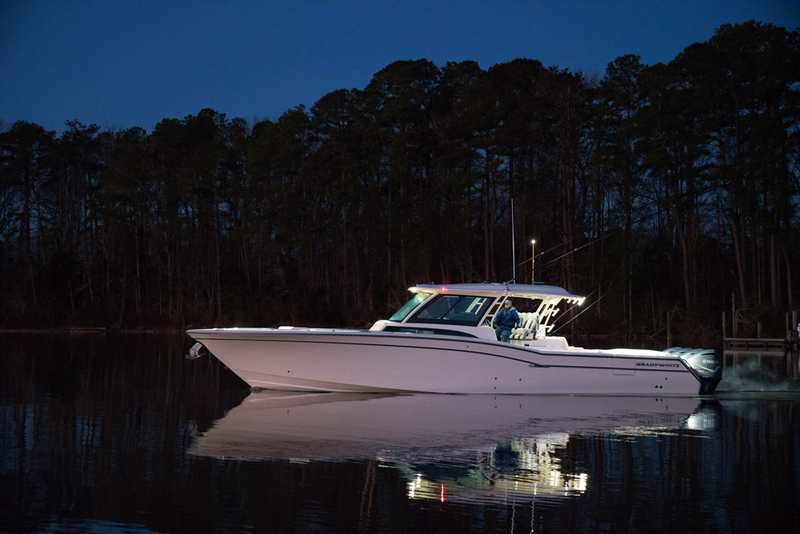 It meets the demands of those that want to be comfortable on the water cruising and for those that are really serious about fishing. For some dedicated fishermen, rod storage and space to fish around the boat is everything. bc: In Miami, the Canyon 456 was outfitted with quad Yamaha F350s, noted with a top speed of 55 mph and a cruising speed in the mid-30’s. At cruising, the fuel consumption is about 0.6 mpg. CCO: For being such a big boat (you mentioned it’s also 12 tons dry) that’s not bad. It costs a lot of money to fill these bad boys up. 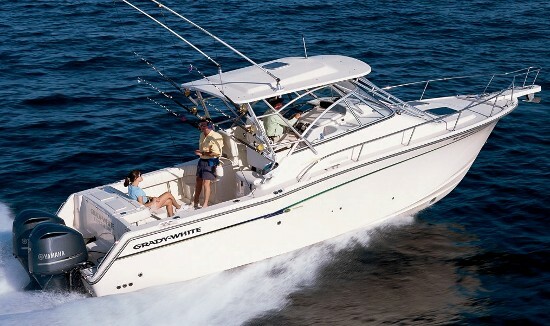 The boat’s debut was before Yamaha announced the 425 XTO Offshore. It looks like it could be the perfect platform for that engine to get even more horsepower and better fuel efficiency. bc: We haven’t talked much about the interior, but the amount of headroom in the cabin is pretty remarkable for a true walkaround center console boat. One of our colleagues who runs our social media is 6’5 and was able to stand in the galley without ducking. CCO: That definitely speaks to the other part of the Grady-White demographic that knows the name for quality and comfort. If you showed me interior photos first I would have assumed it was a cuddy cabin. As the name would suggest though, it’s built for bluewater fishing in the canyons but with the comfort of an apartment at sea. 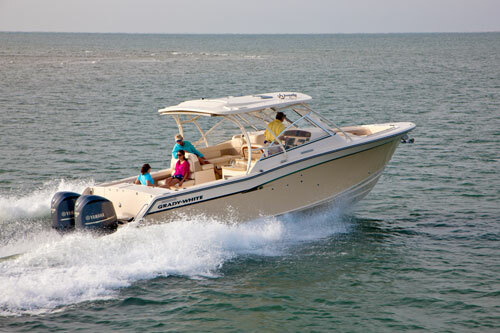 bc: For the last question: Your followers are so passionate about center console boats. Have you learned anything from them? CCO: Definitely have. I’ve learned from them but I’ve also learned a lot about the boating public in general. I learned that I have one opinion, but there are so many other opinions out there. I’ve learned to be completely unbiased and to read the comments for other people’s experiences. After paying attention to their comments, you can learn who really knows what they’re talking about and which ones are pulling your leg. 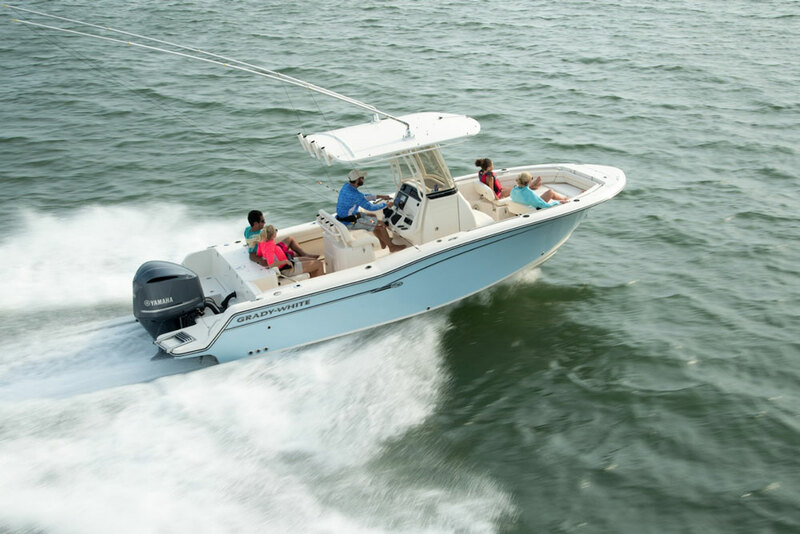 It’s also been fun learning about new brands and bringing them exposure to this group of passionate boaters, but manufacturers of all sizes can really grow their customer base by finding the right message they want to share.